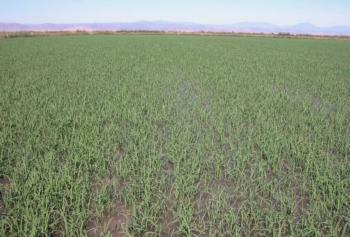 Flooding rice fields suppresses weeds and pests. Then the water is recycled in other crops or returned to the river. For more than 100 years, farmers in the Northern Sacramento Valley have been growing rice, one of the most important staple crops in the world. Because rice seedlings are sown in standing water, the crop has an undeserved reputation of being a heavy water user, says Chris Greer, UC ANR Vice Provost who served as a rice advisor in the Sacramento Valley for more than a decade. After suppressing weeds and pests in the rice field, water that flows out of the field is used elsewhere or returned to the river. California farmers typically produce over a half-million acres of rice annually, with a market value of about $1 billion. But during the last two years of drought, the acreage has been cut by more than 25 percent, posing a significant hardship to growers, laborers associated industries, and rural economies. “Imagine if you had your salary cut by 25 percent,” Greer said. While Greer was still working on a doctorate degree in plant pathology at UC Davis in 1996, he made a key discovery. At the time, California was thought to be free of rice blast, a fungal disease caused by Pyricularia grisea, which is considered the most serious rice disease worldwide. 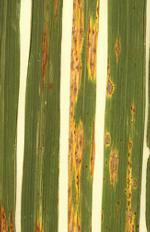 Greer observed symptoms of the disease in Sacramento Valley fields. Tests confirmed the presence of the fungus. In a late-1990s survey of more than 500 rice fields in five Sacramento Valley counties, rice blast was confirmed in 33 of them. Throughout his career, Greer has continued to research and advise farmers about rice blast and other diseases. He said water management plays a critical role in controlling rice blast disease. Researchers are also looking for rice varieties that are resistant to rice blast. UC ANR Cooperative Extension advisors regularly work with rice breeders at the California Rice Experiment Station to evaluate new varieties for their suitability under California growing conditions and for other characteristics, such as yield, milling quality and disease resistance. In 2014 Greer was named the first vice provost of UC ANR Cooperative Extension. In this role, Greer guides all UC ANR Cooperative Extension county-based programs, broadening his scope to include programs in agriculture, natural resources, 4-H youth development, and nutrition education. A focus of his efforts has been increasing the footprint of UC ANR in the state. “We are working with our partners – farmers, state and federal agencies, local governments and commodity organizations – to identify new areas of need for the people of California,” Greer said.